Welcome to my site which brings a diverse range of art to you in the comfort of your own home. All the work is original and has a wide variety of styles to suit all tastes. We all have different ideas of what art should be and the right blend is to have a good mix of realism and contemporary. Art is many things: Exotic, soothing, colourful, inspiring, decorative. Art may be chosen for a colour scheme to compliment a room or space. Others for the uniqueness or atmospheric presence. Sometimes a tendency for a certain media such as watercolour. Acrylic Vibrant and great for abstract work. Pastels Velvety and soft. Especially good for portraits. Inks Either acrylic or Indian. Vibrant, flowing, contemporary. Oils Luxurious and good for blending and detail. Mixed Media is gaining in popularity and can be used on any surface creating wonderful textures and unique appearances. 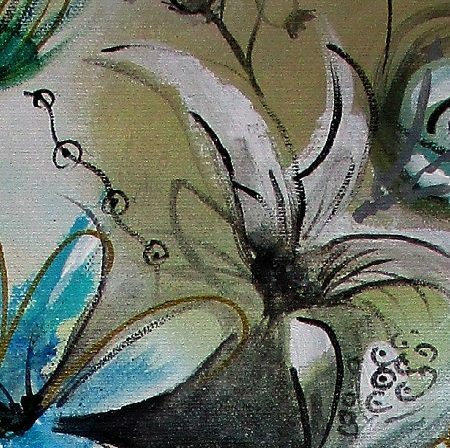 Depending on the choice of media the surfaces are usually: Canvas , Canvas Board, Watercolour/Pastel Paper, Vellum and Heavy Cartridge Paper. Mixed Media is gaining popularity which can be used on any surface creating wonderful texture and unique appearances. Art for the home or office can be chosen for colour schemes or the mood of the surroundings. Check the space for hanging the work. Make sure the painting is neither too large or too small for your wall. Sizes and media information are given for each piece on this site. Please browse the different categories and use the contact form if you wish to make an enquiry.